Also known as sunprints, Cyanotypes are the original blueprints and were used in the first photographically illustrated book, Photographs of British Algae by Anna Atkins. The process uses light sensitive iron salts and ultra violet light (hence sunprints) and so it is a relatively cheap way of making photographic prints. The emulsion can be applied to almost any slightly porous surface that can be soaked in water. Now, I can't remember the names of the chemicals we used (perhaps I should have taken notes) but you make the emulsion in two parts and it only becomes light sensitive when you mix them together. After painting the mixture onto water colour paper we left it to dry for about 20 minutes. Instead of using the sunlight to make our exposure which probably would have take a few hours, we popped over to the textiles workshop and borrowed their uv exposure unit thingy that they use for screen printing which meant we only had to expose the paper for a few minutes. 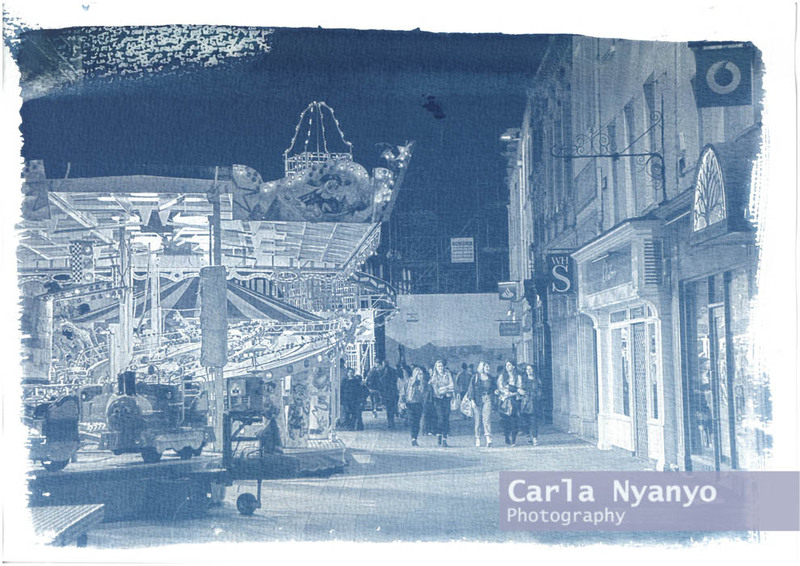 This image I made using a digital photograph I took at the Hereford May fair earlier this year which I turned to a negative on the computer and printed on acetate. I'm really pleased with how well it turned out and how much detail was retained. The photogram below hasn't worked as well. The leaves I've used were quite thick so not much of the detail has come through but it would started to if the exposure was longer.